Just for a change from zentangle I thought I'd show some paper piecing using both stamps and dies, as well as how inking up an embossing folder can add depth and detail. I started off by using a brayer to apply Versafine Majestic Blue ink to the inside front panel of the Crafters Companion Embossalicious 8"x8" cloud embossing folder and embossed a piece of white card. This enabled me to get raised white clouds against a blue sky background. 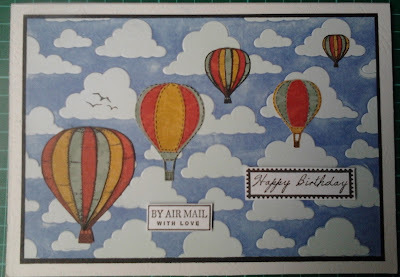 I die cut both sizes of Memorybox balloon using 3 different coordinating papers and also stamped all three sizes of Claritystamp balloon stamp onto each of the same three papers. Having trimmed down as appropriate I matted the different coloured papers together creating a little depth. I then used a black fineline pen to add dashed lines round the die cut balloon layers, to tie them in with the stamped images. onto an A5 landscape white card blank. I'm entering this card into the That Craft Place as well as the Live and Love Crafts' Inspiration and Challenge as they both have the theme 'blue'.